The major players that are comprised in plant factory grow lights market are Daystar, APL engineered material, Siemens Philips horticulture Lamps, Advanced lighting Technologies, Hydrofarm, General Electric, Sun System, Iwasaki Electric, Taiwan Floriculture Exports Association, and other. These players are set to foster the development of plant factory grow lights market. 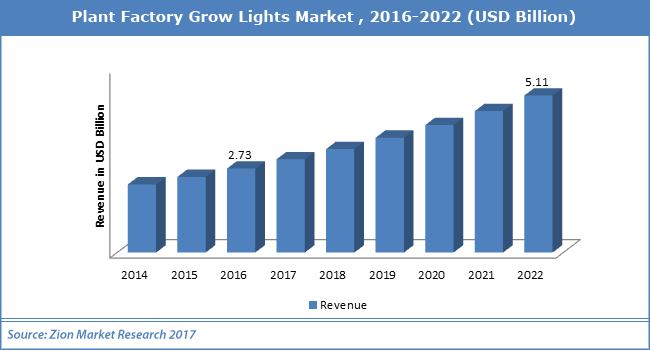 According to the analysts at Zion Market Research, the Global plant factory grow lights market was capitalized USD 2.73 Billion in 2016 and is likely to cross almost USD 5.11 Billion by end of 2022, at a CAGR of 11.01% between 2017 and 2022. The global plant factory grow lights market is expected to develop at a noteworthy rate, as per analysts Zion Market Research. The requirement for organic vegetables and plants has increased all over the world while the comparative supply has not been capable of matching the requirement. This has resulted in the development of the plant factory system, which is an automatic farm with enhanced techs and can work 24 hours a day without relying upon climate. This boosted the plant factory grow lights market considerably. Government regulations and initiatives to accept energy-efficient LEDs can be one of the major boosters for the global plant factory grow lights market. The plant factory grow lights market creates more yields in less time, which can be one of the catalysts for the global plant factory grow lights market. Various players launching new products are also set to foster the development of plant factory grow lights market. For example, in June 2018, the German-based global lighting firm Osram started supplying the NASA (National Aeronautics and Space Administration) with a customized model of Phytofy RL (its linked horticulture research lighting system,). The unique product will employ smart grow lighting software to augment the lighting technology employed in Food Production by NASA. Plant factories are believed to be the future of farming as well as plant factory grow lights market. Increasing techniques such as vertical farming and the rising implementation of modern agriculture have elevated the investment & interest for related technology and plant factories. In addition to this, it is believed that plant factories can offer a more competent way to offer food for the growing population in the world. The global plant factory grow lights market is divided into technology, application, and regions. The application sector of plant factory grow lights market includes indoor farming, vertical farming, landscaping & turf, commercial greenhouse, research and others. The technology sector of plant factory grow lights market includes fluorescent lighting, high intensity discharge, and others including led. The plant factory grow lights market is analyzed on the basis of five areas namely Europe, North America, Latin America, Asia Pacific, and Middle East and Africa.